I was that exhausted from expending so much nervous energy on the Saturday under the careful gaze of Franco Ferrero that on the Sunday I was almost too laid back for Mike McClure's liking. Now bear in mind that neither assessor speaks to the other, or the candidate, about the performance they observed until the end of the second day, I really had no idea what the outcome might be. So when Lara Tipper, course director, shook my hand and said "Congratulations Mark, you've passed" I had to ask her to say again, and slowly, what she'd just announced! It was a tremendous relief to drive away from Moelfre with Lara's words ringing in my ears and the comprehensive written feedback I'd received from Mike and Franco sitting on the passenger seat. I felt a huge sense of satisfaction knowing that the hard work and preparation had paid off. It was just such a damn shame that my mobile phone had no power, so some poor pedestrian had to endure me dancing on the pavement as the realisation of my achievement sunk in. On reflection I feel that all the circumstances came together at the right time for me in order that this might have a happy ending. Paul and Richard made an immense effort to commit to a long term development programme. In particular, Richard overcame a back injury at the 11th hour to ensure the team was complete for the Sunday. They both showed an unbending faith in my abilities which I think cemented the coach/student relationship so well. Nick Cunliffe did his uppermost to offer guidance, humour, wisdom and limitless support whenever I asked for it. He was there to pick me up when I thought my paddling mojo had been lost and kept me in line when my ideas got too fanciful. Without these folk it may have been a different story. It goes without saying that there are many others who have contributed to my success. Gordon Brown provided several doses of no-nonsense advice. Jen Kleck made numerous helpful observations about her assessment experiences that I know played a pivotal role in my own planning. I'm grateful to Aled Williams of Tiderace Kayaks and Mike Webb of Rockpool for the use their boats. Also Aled for his unique insights into boat handling which will always make him a 6* paddler in my eyes. Sid Sinfield certainly played a part in his own inimitable way as have many others who I hope don't take umbrage for not being named here. Fair to say, a big thank you goes out to one and all, fellow coaches and students alike for being there along the way. Ive been reading your blog for a while and the "Long term student development" series are one of the best things I have yet read on a blog. A great achievement. Well done from both of us. That’s AWSOME! Congrats on getting certified as a 1* coach! Oh wait, sorry 5*. Congrats, that is some award!! Surely this must be the end of the beginning! Hi Mark, congratulations - job well done! CONGRATULATIONS on becoming a ****** coach .... that's a long, hard road to travel nowadays. You deserve it. 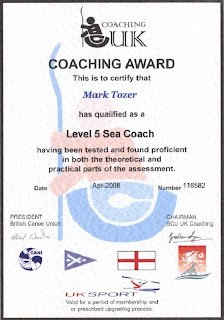 I would like to congratulate Mark on his achievement of gaining the L5 (Sea) Coach award. As a 'long term student' and friend of Mark I have had a glimpse of the work and commitment needed to achieve L5. Mark has been the catalyst to move my personal paddling skills and confidence forward and whatever one's views of the BCU or coaching scheme its good to know there are such skilled people at the top of the coaching ladder. Well done, Mark! And I look forward to our next paddle …. And a beer!